My family has been been on a Parks and Recreation binge over the last few months, so I’ve been watching a lot of Amy Poehler. I received an ARC of Yes Please when it came out last fall, but hadn’t gotten to it yet, so I decided to listen to it on audio a few weeks ago. Many hours of Amy Poehler in the car! 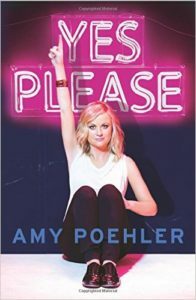 Yes Please is Poehler’s memoir about her childhood, her early years in comedy in Chicago, her time on SNL and (thankfully) her experience on Parks and Recreation. Along the way, Poehler shares her insights on being a working mom, her divorce (a little), her children, and some celebrity gossip from SNL and various awards shows. Yes Please is well-written and, if not chronological, at least loosely organized around themes and phases of Poehler’s life. I read Tina Fey’s Bossypants 5 years ago (review here), and I just re-read my review of it. On the surface it sounds an awful lot like Yes Please. But I liked Poehler’s book better. I think there’s more substance, and more to take away from it. Maybe I identify more with Poehler, with her 80s childhood and her pop culture influences. Maybe it’s because it was narrated for me by Poehler. Regardless, I think it hangs together better as a book. Poehler is relatable and funny and imperfect. She is generous to others and grateful for their roles in her life. And part of her is Leslie Knope, and who doesn’t love Leslie Knope? I could have done without all the whining about how hard it is to write a book. Yes Please isn’t the deepest or most satisfying book I’ve read recently, but it was a lot of fun and certainly made my commute go by faster. As for the audio narration – it’s really fun to hear it all in Poehler’s voice. She has a few guest narrators – Seth Meyers, her parents, the creator of Parks and Recreation – but I like her solo sections the best.